Algoa Bay is soon to be launched as one of South Africa's five Hope Spots. Mission Blue has been declaring special marine conesrvation areas all over the world as Hope Spots, as they are critical to the health of our oceans. With the support of the Sustainable Seas Trust these five South African hope spots will be launched in December this year and will hopefully inspire people to take better care of our oceans and the animals that inhabit them. Algoa Bay was chosen as one of these hope spots because of its natural beauty and incredible biodiversity. Algoa Bay is home to the largest breeding colony of the endangered African penguin in the world. We have roughly 22,000 penguins living on our doorstep, St Croix Island, which is why these comical and clumsy birds have been chosen as the iconic species to represent the bay. Penguins have captured the hearts of people all over the world and we hope that with the spotlight shining on them they might get the drastic help they need to put a stop to their declining numbers. Raggy Charters has been helping SST to design a logo for this new hope spot. And with the help of graphic designer Malcolm Kroon we have come up with the following..
Not only is Algoa Bay home to the largest breeding colony of African penguins in the world but we also have the largest gannetry on the planet with 250,000 Cape gannets breeding on Bird Island. Closeby is a small islet called Black Rocks with 6,000 Cape fur seals mating and resting. Throughout the year we have bottlenose, common and humpback dolphins entertaining us with graceful leaps in to the air. In the winter months we are visited by migratory humpback and Southern right whales. These gentle giants swim North to the warmer waters of our coast to give birth and mate. Bryde's and minke whales can be spotted all year long, more commonly between February and July as we see the sardine run pass our bay, along with other bait fish. Killer whales are also becoming a more common appearance, being spotted two or three times a year. And we also lookout for the pelagic birds which visit us between May and September; albatrosses, petrels, shearwaters, terns, and the charismatic skuas. Algoa Bay certainly has a lot to offer with marine life, which is why it is so important to conserve that. The Baywatch Project and the Sustainable Seas Trust are both committed to raising awareness of the need for marine conservation by educating the public about environmental issues. 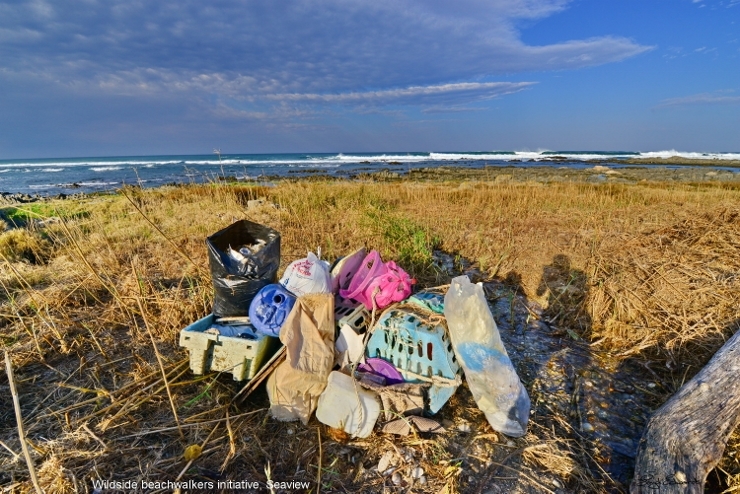 We encourage people to take action and the best way to start is through regular beach clean-ups. Raggy Charters, in association with the Baywatch Project, has recently launched the Wildside Beachwalkers Initiative. We have been cleaning up the beaches of Seaview and the surrounding areas every time we do a boat cruise. This is what the Raggy Charters staff has recently collected through a few short sessions..
We hope that others will follow suit and take a bag with them whenever they go to the beach, with the dog, or for a stroll, and clean up any plastic and other rubbish you find. The best way to keep our oceans clean, and to keep Algoa Bay clean, is to keep our beaches clean. The rubbish that gets piled up on our beautiful beaches, whether they came from the ocean or not, eventually end up back there. This rubbish contributes to animal strandings, entanglements and ingestion of harmful things, which can lead to death. Let's keep our oceans clean!